Q: Recently, the Catalonian autonomous region's parliament voted to pass the motion for "independence" and declared the "establishment of an independent state". The Spanish government said it would invoke Article 155 of the constitution as a firm response. What's your comment on this? A: China's position on this issue has been consistent and unequivocal. We think it falls within Spain's internal affairs. We understand and support the Spanish government's effort to uphold national unity, ethnic solidarity and territorial integrity, oppose the act of splitting the country and undermining the rule of law, and believe Spain is capable of upholding the social order and safeguarding the rights and interests of its citizens. China and Spain are friendly countries. We will continue to develop friendly cooperation in various fields with Spain following the principle of mutual respect for each other's sovereignty and territorial integrity and mutual non-interference in each other's internal affairs. Q: After the 19th CPC National Congress, Minister of the International Department of the CPC Central Committee Song Tao will visit Vietnam and the Laos to give a briefing on the Congress. Is a visit to the DPRK in China's plan? A: The International Department of the CPC Central Committee has released the information on the upcoming visit to Vietnam and the Laos by President Xi Jinping's special envoy Song Tao. With respect to whether the Department has additional visit plans, I'm not aware of that at the moment. The international community is closely following the successful convening of the 19th CPC National Congress. We are willing to stay in close communication with various countries and brief them on the relevant information of the Congress. We hope to continuously advance our mutually beneficial and friendly cooperation with other countries in various areas and jointly promote the building of a community of shared future for mankind under the guidance of the spirit of the 19th CPC National Congress. Q: What are China's main objectives for President Donald Trump's visit? Reports say that the US and Chinese officials will sign deals regarding a multi-billion dollar Chinese investment in the US oil industry. What is China's position regarding potential investment in the US energy industry? A: China attaches great importance to China-US relations. We believe the sound and steady development of China-US relations serves the fundamental interests of the two peoples and are in line with the shared aspiration of the international community. The 19th CPC National Congress just concluded successfully. We believe that the success of the 19th CPC National Congress will inject strong impetus to the enhancement of the exchange and cooperation between China and other countries around the world, including the US. Following the important consensus between President Xi Jinping and President Trump, China stands ready to work with the US to focus on cooperation and manage differences on the basis of mutual respect, mutual benefit and reciprocity and push for greater development of the China-US relations. President Trump will pay a state visit to China upon the invitation of President Xi Jinping shortly. The Chinese sides hopes that this visit will promote more mutually beneficial cooperation between the two countries, bring more tangible interests to the two peoples and make greater contributions to world and regional peace, stability and prosperity. As for the cooperation in the field of oil and energy, I have no more information to offer at present. Q: A question on what happened in Catalonia. Do you think the current situation could harm Chinese investment or business in Catalonia? Will China issue a travel warning to Chinese citizens traveling to Catalonia? A: We think what's happening in Catalonia is Spain's internal affairs. We understand and support the Spanish government's effort to uphold national unity, ethnic solidarity and territorial integrity, oppose the act of splitting the country and undermining the rule of law, and believe Spain is capable of upholding the social order and safeguarding the rights and interests of its citizens under the framework of law and system. We will continue to develop friendly cooperation in various fields with Spain following the principle of mutual respect for each other's sovereignty and territorial integrity and mutual non-interference in each other's internal affairs. Regarding whether we will advise Chinese citizens not to travel to a certain region for the time being, the relevant Chinese diplomatic missions will issue such information as needed. I have no information in this respect by far. Q: Since last Friday, Spain's central government has taken over Catalonia. Has the Chinese government been in touch with the Spanish government or Embassy about this question? Have you received any pressure in condemning the Catalonian "independence"? A: China and Spain are friendly countries. We have been maintaining close communication on various kinds of issues, especially issues of our respective and mutual concern. The international community has been closely following the situation in Catalonia. We have noted the remarks from various parties of the international community, and the Chinese side is also paying great attention. We hope and believe the Spanish side is capable of upholding the social order and safeguarding the rights and interests of its citizens under the framework of law and system. I would like to reiterate that we understand and support the Spanish government's effort to uphold national unity, ethnic solidarity and territorial integrity. Q: The technical hold China placed on August 2 on the application to the 1267 Committee to list Masood Azhar will expire on November 2. Whether China will approve or block the application? What's China's position on the matter? Has that changed since three month ago? 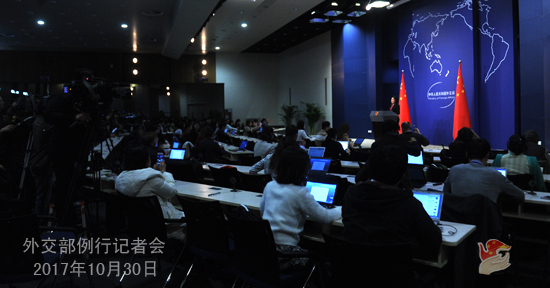 A: We have elaborated on China's position many times at request. The relevant Security Council resolutions have clear stipulations on the mandate of the 1267 Committee and explicit requirements for the listing criteria of terrorist organizations or individuals. China always maintains that on the listing matter, the 1267 Committee shall uphold the principle of objectivity, impartiality and professionalism and make its decisions by borad consensus among its members on the basis of solid evidence. As for the listing application raised by the relevant country, there are different views within the 1267 Committee. China proposed the technical hold so that more time was given to the Committee for deliberations and to all relevant parties for further consultations. Regrettably however, the Committee has yet to reach a consensus. The action we took at the 1267 Committee, which was meant to uphold the authority and validity of the Committee, accorded with the resolutions of the Security Council and the rules of procedure of the Committee and showcased a responsible attitude. China would remain in communication and coordination with all relevant parties in line with the resolutions of the Security Council and the rules of procedure of the 1267 Committee. Follow-up: Why is China the only country putting a technical hold? Does China have its own personal interests in defending Pakistan? A: I can understand why you asked this question, but I cannot agree with what you said in it. 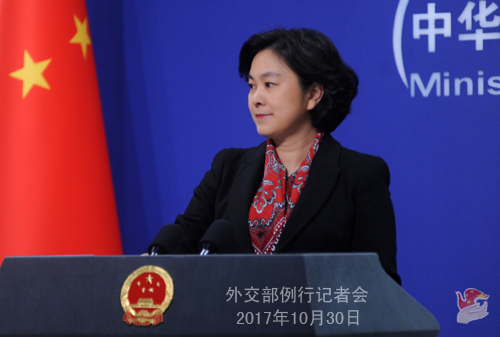 China has been objective and impartial on the counter-terrorism issue, making its judgments and decisions on the merits of the matter per se. Pakistan is a victim of terrorism. We support Pakistan in carrying out counter-terrorism actions based on its own national conditions. Also, China has been advocating greater international cooperation to address the threats of terrorism and maintain regional and international peace and security. Like what I just said, the relevant Security Council resolutions have clear stipulations on the mandate of the 1267 Committee and explicit requirements for the listing criteria of terrorist organizations or individuals. In light of an absence of consensus on this matter within the 1267 Committee, China acted to protect the authority and validity of the Committee, which met the rules of procedure of the Committee and just best showcased our sense of responsibility. We would remain in communication and coordination with all relevant parties in line with the resolutions of the Security Council and the rules of procedure of the 1267 Committee. Q: Last Friday, Britain urged the UN Security Council to place sanctions on Syria after an OPCW-UN joint investigative mechanism claimed in its report that government forces were responsible for the sarin gas attack on civilians. Will China support such sanctions? What does China make of the results of that investigation? A: China's position on the issue of chemical weapons remains consistent and clear-cut. 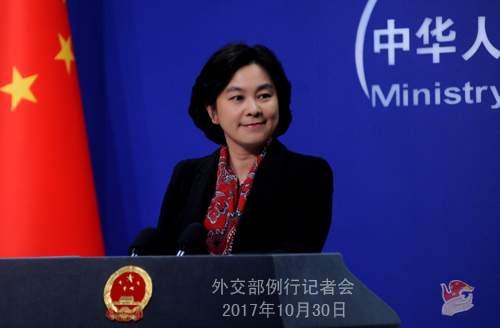 China is opposed to the development, stockpiling and use of chemical weapons by any country, organization or individual for any aim under any circumstances. We believe the joint investigative mechanism should strictly fulfill the mandate given by the Security Council and draw a conclusion grounded on professional investigation that will stand the test of time and reality. Q: On the morning of October 30, when called to the National Assembly to answer questions, ROK Foreign Minister Kang Kyung-wha said the government's current stance of not joining the US anti-missile system remains unchanged. The ROK-US-Japan security cooperation will not be developed into a tripartite military alliance and the ROK government has no consideration for additional deployment of the THAAD system. What's you comment on this? A: We value these three aspects of the remarks by the ROK. The Chinese side has always been opposed to the deployment of the THAAD system in the ROK by the US. We hope the ROK will faithfully follow through on its above-mentioned commitments, properly handle the relevant issue and bring the China-ROK relations back to the track of steady and sound development at an early date.